You know that saying don’t judge a book by its cover? Well, it’s true. Often when you get to know more about someone or something you find out characteristics and facts about them that are surprising. The more I learn about chocolate the more surprises I find. 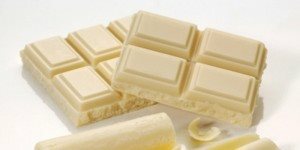 The latest shocker: white chocolate is not technically chocolate! It doesn’t have the ingredients that define a food as chocolate. That led me to thinking, what is white chocolate made of if it doesn’t have any chocolate in it? In the chocolate making process, after the cocoa beans are dried and shelled, what’s left of them is the part inside the shell, known as the nib. The nibs are ground into a liquid, which is called chocolate liquor. Chocolate liquor separates into chocolate solids and cocoa butter. The solids go in chocolate and they’re what give chocolate its flavor and brown color. White chocolate got its misleading name because it is made from cocoa butter. Cocoa butter is the fat from the chocolate liquor. White chocolate is a mixture of cocoa butter, sugar and milk solids. Without the cocoa solids, white chocolate isn’t really chocolate. It can be disappointing or even scary to learn more about someone or something but it can also be rewarding. Learning more about chocolate and what its benefits can be has made me even more of a chocoholic. Hopefully learning white chocolate’s secret won’t hinder your love for all things chocolate.